We started the morning in Coimbra with breakfast at the Hotel Oslo. Spectacular view of Coimbra from the roof-top restaurant, but the clouds had not burned off yet, so not photographically interesting. It was then to the train station, where we had the first major travel incident since the New Delhi train station. Spousal confidence keeps from saying more about the New Delhi incident, but by comparison, this one was rather minor. When we arrived at Coimbra, we arrived at Station A, changed trains for a four-minute excursion to Station B on a different train. Logic would suggest that we would repeat that process to get to Porto, which is north of Coimbra, so we got off the train at Station A to wait for the train that would take us to Porto. Whoops, we weren't supposed to get off that train. The mark of a good travel agent is the recovery. Evelyn changed tickets, and we were soon on an express train to Porto, losing about five to ten minutes. We arrived at our hotel, the Pestana Porto Hotel, which Rick Steves describes as a splurge and the hotel claims is in a World Heritage site. Located in the Riberira district, the hotel overlooks the banks of the Douro, offering a spectacular view of the Dom Luis I bridge. Declining the complimentary glass of port, we headed straight up the hill through the narrow streets. 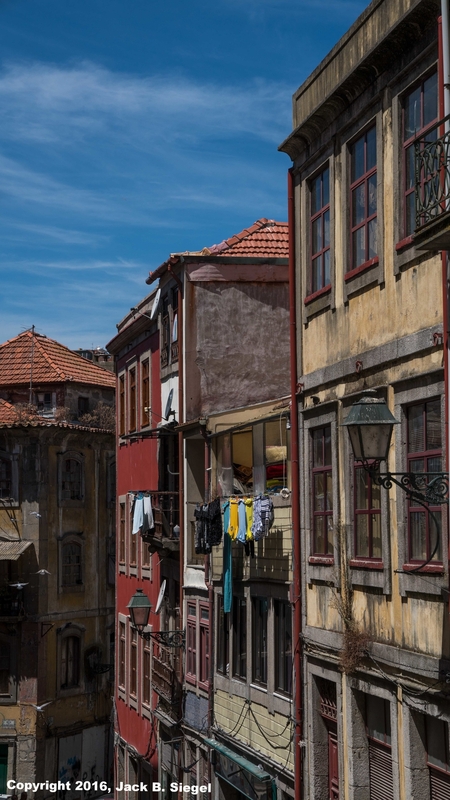 Laundry was hanging from just about every building, but the residents do enjoy many of the conveniences of modern life, including satellite dishes, which in my view are photographically incongruous with buildings that were built decades if not centuries earlier. 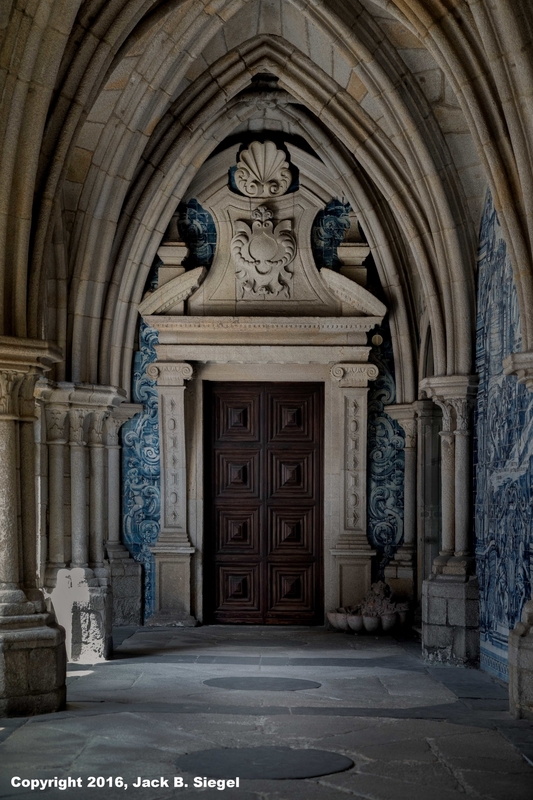 After reaching the top, we encountered the Sé do Porto, a Romanesque fortress that includes Porto's largest cathedral, together with a stone cloisters. We spent an hour or so exploring the complex, and then headed downhill to the São Bento Railway Station, which is famous for its tile murals in the entrance/waiting room. One scene depicts local-boy-made-good Prince Henry the Navigator conquering territory in Portugal's name. After using the station's WC--immaculate--we headed to the Rua de Santa Catarina. Our destination was Cafe Majestic, an Art Nouveau cafe that once was the haunt of the city's intellectuals, but now is overrun with tourists (including us), like Les Deux Magots in Paris. We were seated in the back of this richly appointed establishment, which provided us with a great view of the comings and goings. We both opted for almond torte, which was excellent. I also had a glass of 20-year old tawny port. Yes! Most impressive was the wait staff. Dressed in formal whites with gold epaulettes, the staff was the model of Prussian efficiency. It was like a beehive, with the staff running back and forth to and from the bar counter, with trays that often held four or five colorful drinks. One cashier served as the conductor. Most establishments would require a service staff double in size, but these folks hustled. After about a 45-minute break, we headed out, walking along commercial streets and the Imperial McDonalds. It was then up to Clérigos Church and Tower--both in the Baroque style. The church is lovely, particularly because it is well lit, but the tower is why there are lines. It took us a half hour to get to the front of the line, and then up we went. As usual, I had my issues with vertigo, but I kept climbing. We made it to the second level from the top. It was Evelyn who decided that it was not worth ten extra steps to get to the top--too narrow, too many people, and not enough change in elevation to make much of a difference. I gratefully chose not to argue. It had been a long couple of days, and it was hot, so we ate in the hotel's restaurant, which was a steakhouse. By this point of the trip, we are not looking for fancy meals. This steakhouse was filled with families. Although the dishes coming from the kitchen looked great, we opted for hamburgers, which proved to be pretty terrible. More like meat loaf than chopped sirloin. I could taste the Lipton's onion soup (I am sure that was not an ingredient, but the food reminded of 1960s style meatloaf recipe that was found on the back of a soup box). Earlier in the day, while on our walk to the Clerigos Church and Tower, we encountered a boisterous group of German twenty-somethings at an outdoor bar in full Munich beerhall mode. Loud and obnoxious. When we headed back to our room later that evening, we heard similar loud and obnoxious singing. The night of November 9, 1938 came to mind--Kristallnacht--as did the famed Hitler Youth. When I stepped outside, I saw a group of 75 of these idiots posing for a group photograph as they continued to sing. The singing went on late into the evening.